JByteStat 2.0 (30K - includes source code) - What's new? What is the JByteStat utility? The Java ByteStat utility is an open-source byte histogram utility which can be used for simple data analysis. 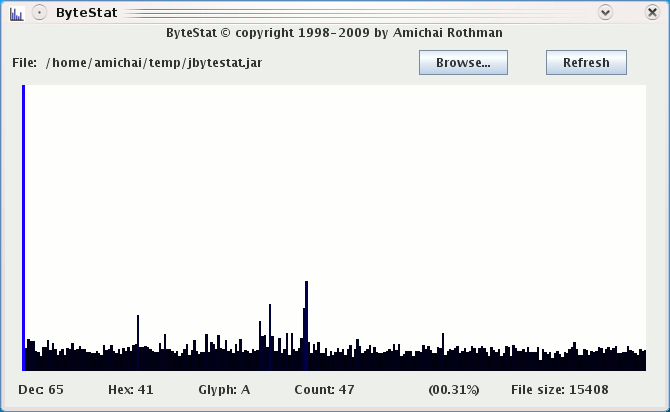 It visually shows the byte histogram - how many times each byte value (0-255) appears in a file. How do I use the JByteStat utility? The Java ByteStat utility is written in pure Java, and thus requires no special installation. The provided jar file is executable, so you can run it using 'java -jar jbytestat.jar', or on some systems, just double-click the jar file. The graphical user interface is simple and intuitive. This is the first release of the Java ByteStat utility, which is a port to Java of the native 1.x ByteStat releases. The JByteStat is provided under the GNU General Public License agreement. For non-GPL commercial licensing please contact the author. Please write in with any bugs, suggestions, fixes, contributions, or just to drop a good word and let me know you've found JByteStat useful and you'd like it to keep being maintained.